Home → Buyer Beware → Restore Supplement Review, Can it Improve Your Digestive Health? 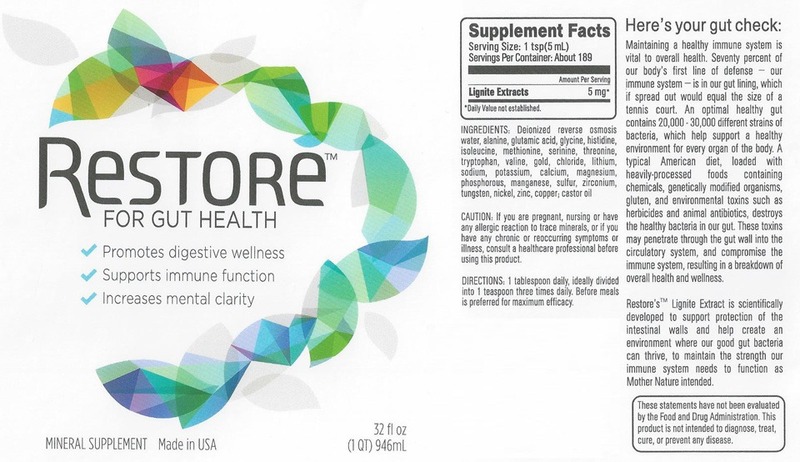 Restore is a supplement that claims it relieves leaky gut and improves digestive health. Restore is supposed to relieve gluten insensitivity, leaky gut, heartburn, restore the immune system, relieve SIBO (small intestine bacterial overgrowth), renew the microbiome, and improve overall digestive health. Restore is well known and is even offered at your local GNC. Could it contribute to improving your digestion? Is there enough research to establish its safety and efficacy? Should you try the supplement or is it a waste of money? What is Restore and How Does it Work? Restore is a supplement that is manufactured by Biomic Sciences (originally New Earth Dynamics) in the United States. The supplement is a liquid lignite extract (Terrahydrite), mineral amino acid complex, and purified water (previous formula also had castor oil). Lignite is technically a type of poor quality coal (low energy content), it is not traded extensively on the world coal market. Terrahydrite contains trace soil amino acids and minerals similar to a fulvic acid supplement. The supplement comes in a BPA-free (bisphenol a) plastic bottle and does not need to be refrigerated. Finally, the mineral amino acid complex used to be listed in a prior formulation as alanine, glutamic acid, glycine, histidine, serine, threonine, isoleucine, valine, gold, chloride, lithium, sodium, potassium, calcium, magnesium, phosphorus, manganese, sulfur, zirconium, tungsten, nickel, zinc, and copper. 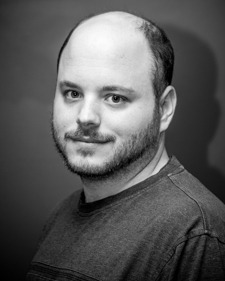 says Zach Bush, MD, CEO and co-founder of Biomic Sciences, LLC. Dr. Bush is board certified in Internal Medicine, Endocrinology and Metabolism, and Hospice Care. Notice something odd about the statement above? The statement does not give any specifics on how the supplement works to help people recover. The website does, however, provide a few studies to help us understand better how Restore works and to reassure us that it is safe, but is the information accurate? Is There any Evidence That it Works and is it Safe? The lignite extract from what I can understand according to their trans-epithelial electrical resistance study coats the tight junctions in the gut and protects them from incoming irritants. It insulates the cells in the gut against a bombardment of electrons. Protection of the gut junctions sounds great in theory, but it is unknown how well it will occur from ingestion of Restore. Their studies were performed in a controlled environment and were done in-vitro on a group of cells. Will Restore fully coat the intestinal tract or just the mouth, esophagus, and or stomach? The Restore studies show that it may be able to protect our gut from toxins including the pesticide, glyphosate. Restore might be able to protect the gut cells from ingestion of gluten for example, but not from our gut microbiome ingesting the gluten and polysaccharides in wheat that we consume. It would not be able to protect from all the issues that stem from our microbiome consuming gluten if you have dysbiosis (increased endotoxin creation by Gram-negative bacteria, increased fermentation creating bloating, leading to inflammation and immune reactions within the gut). 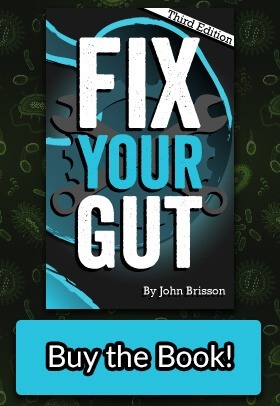 Even if the gut junctions are protected by the supplement, inflammation would be confined to the gastrointestinal tract from increased endotoxin production, causing digestive issues. Finally, Restore might cause constipation (similar to ingestion of other soil products, clay, and activated charcoal) and very rarely might trigger an allergic reaction to the minerals in the lignate extract like nickel (causes a rash). Proper water consumption and magnesium supplementation might help the constipation. 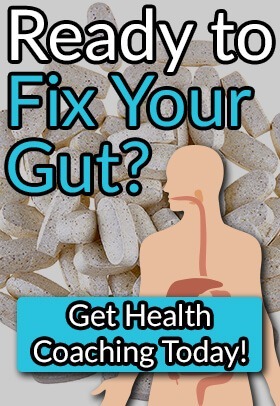 Does Fix Your Gut Recommend Restore? Restore appears to be a supplement that is a roulette wheel with a lot of people that try it to improve their digestive health. Most people on the SIBO Facebook group that tried the supplement found little improvement if any at all from using it. I believe that people with severe digestive concerns may see no change in their issues with Restore because it does not fix the underlying problems, diet, microbiome dysbiosis, and motility issues. I have suggested Restore to a few clients here or there to see if they would get any improvement from using it, telling them upfront my concerns about the supplement. Some did, and from the ones that took it, it did not seem to be the miracle leaky gut fixer that Biomic Sciences alluded it to be. Would it harm you to try Restore? Probably not, but do not use it believing Restore is the panacea for leaky gut it is touted to be. Fix Your Gut cannot fully recommend Restore without further studies on its efficacy and safety, which are not performed by Biomic Sciences. We were recently introduced to Restore by functional medicine. My son has taken numerous high end products to address his gastric health issues – very costly xymogen which have been helpful but certainly not the whole picture. Restore claims there are no side effects other than possible temporary constipation. We have used it a few times and have not noticed any ill side effects from it but I try to be super careful because this is unchartered territory without sufficient studies to back-up claims. I did feel concern when I got this $50 bottle with inadequate dispensing mechanism – one teaspoon that drips and spills when you attempt to dispense it. This seems like a company that is unsophisticated and perhaps standing on shaky ground without independent back-up for the claims it makes. That does concern me. If this works then why aren’t the other large, reputable companies such as Xymogen developing a similar product? Leaky gut is a serious condition. I am concerned that this may be an attempt to cash in on the vogue topic of the day – leaky gut – without adequate research. Those of you who have not tried restore I highly recommend you do so. I literally tried a little more than 200 products on fixing my gut issue (Candida, SIBO, parasites, etc). Can’t say nothing ever worked because few of them worked but not they are not cure-all so I eventually had a chance to try this product and I find it quite helpful. I took and am still taking Turpentine, Prescript Assist, Resistant starch, and I think Restore is either 1st or 2nd the most important supplement that I have ever taken. Oh, besides Restore I also recommend turpentine. Search turpentine protocol by Dr. Jennifer Daniels. She posted the protocol for free. It was not free back then when she found out about the protocol. So take advantage of it download it in PDF file and start the darn God-given protocol. I really hope someone finds my message helpful because as a fellow patient I also suffered quite severely and am still trying to recover from gut issues. Did you sign your name with “JD” but then casually refer to Dr. Jennifer Daniels as another person? Are you trying to promote your product? My doctor recommended it to me a few months ago and I’ve admittedly been very bad with my diet. I went back to my doc and my inflammation levels were cut in half from my last visit. The only thing I changed was adding Restore so I’m left to assume it did help. Hi everyone – I’ve been using Restore for 3 months and for my body it’s been great. After the first 4 days I noticed my mind was calmer, that I feel more settled, and after about 2 months I noticed I’m more present in life which is really kind of amazing. I have methane producing SIBO (and Hashimoto’s, fibro, chronic fatigue, detox problems, sulfur and methyl intolerance) and my level of GI gas has come way, way done and I haven’t changed my diet. I’m not free of SIBO, but for me there’s a very noticeable difference while using the product. The first month or so was kind of an adjustment with odd bowel movements, etc but that’s mostly worked itself out. The only thing I have to be sure to do is drink enough water or herbal teas because Restore can also add to my constipation if I’m not careful. I would go low and slow initially when trying it to see how your body might respond. – Also, I wish the Restore team could elaborate further on how it works and what it’s doing but I’m genuinely grateful for the positive changes just the same. 1. There is a supplement from Vitamin Research Products called CeaseFire. It contains DGL (deglycyrrhizinated licorice root and rhizome extract) plus Gum Mastic. It is in table form, which you chew. This kind of product is used in Europe for treatment of H.Pylori. 2.Glutagenics, from Metagenics, is a powder you dissolve in a little water and take between meals, 3xday. After years of waking at night with severe gastric pain I am pain free and don’t have to elevate my upper body to get through the night. Both these products can be ordered on the internet. I’ve been taking restore for about a year now and can’t tell any difference in my gut…I have IBS as well as pancrtities and.i eat no sugar no fat, practically live on oat meal and Greek yogurt…it ha sent helped me, that I know of…had some given to me but will most likely quit taking it tomorrow and see if I can tell a difference…I take a good probiotic and think that helps me more then anything. Kath, don’t make a vague comment like it made your life hell without saying where your helath was beofre and after taking Restore. Whatever you do, don’t take this product. This crap has made my life significantly worse and if I could sue the hell out of Biomic I would. I believe she said..IF I could, a he didn’t say she could so give your comment a rest. And what’s stopping you from “suing the hell out of Biomic”? The fact that you have no grounds to sue, ie. that you weren’t harmed by their product? You can’t just sue people because you’re irritated by them for no good reason. 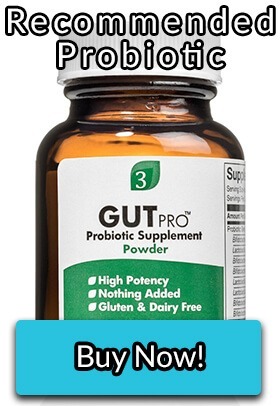 What would you recommend for me I am 66 years old and have very high readings of H. Pylori and reacently suffered from a severe bout of anxiety which I am sure has has been brought on by my bad gut health. I had cancer 8 years ago of the lining of my womb and had a radical hystrocemety followed by brachytherapy (vaginal radiation) and since then have had numerous urinary tract infections and numerous rounds of antibiotics and 2 rounds of triple therapy for the H. Pylori and still have the big. I am desperate to get my gut health back as I feel so unwell and feel like my immune system is destroyed . I am suffering from depression and anxiety now and all my joints have aches and pains. I went from 72 kilos to 47 kilos in a very short time and because I had cancer 8 years ago I was sent foe an endoscopy and colonoscopy and had biopsies taken and the results came back as active H. Pylori and chronic gastritis.